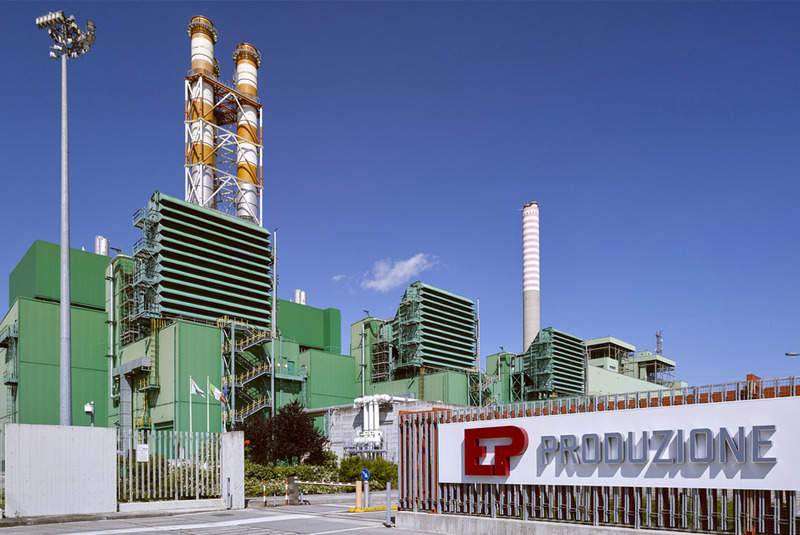 The Tavazzano and Montanaso plant is built on an area of around 70 hectares in the municipalities of Montanaso Lombardo and Tavazzano con Villavesco, in the province of Lodi, 25 km from Milan. It is close to important electricity consumption centres and has a good supply of water all year round thanks to the surface system which consists of the Muzza and Belgiardino canals and the Adda river, water which is needed to condense the steam released by the turbines. The installed power is 1.140 MW and the plant dedicated to electricity production only uses natural gas. Currently two combined cycle CCGT (Combined cycle gas turbine) modules are in use. The first, of 760 MW, came into service in January 2005 and consists of two gas turbines and two heat recovery steam generators, coupled with a steam turbine. The second, of 380 MW, came into service in November 2005 and has a single gas turbine and a single steam generator coupled with the steam turbine. There is also a conventional 320 MW unit (which only uses natural gas), the use of which was suspended as from April 2013. The plant was one of the first industrial sites in Italy to obtain, in 2000, ISO 14001 environmental certification and registration in the EMAS European register under number IT-000032. The emissions from the plant, which only uses natural gas, have fallen markedly compared to previous years, both in absolute terms (tons per annum) and in terms of concentrations. In particular, emissions of particulates and SO2 have no longer been found since 2010, thanks to the end of the use of thick oil. In addition, with the transformation of conventional cycles to combined cycles, the quantity of heat discharged into the Muzza canal (due to the need to condense the steam) has fallen by over 60%. » Download the "Environmental Statement of the Tavazzano plant"
Thermoelectric plant consisting of two combined cycle modules (Bryton cycle) with three gas turbines, powered by natural gas, connected to two steam turbines. Present, but temporarily non-operative, is a conventional 320 MW unit (Rankine cycle), which uses natural gas.